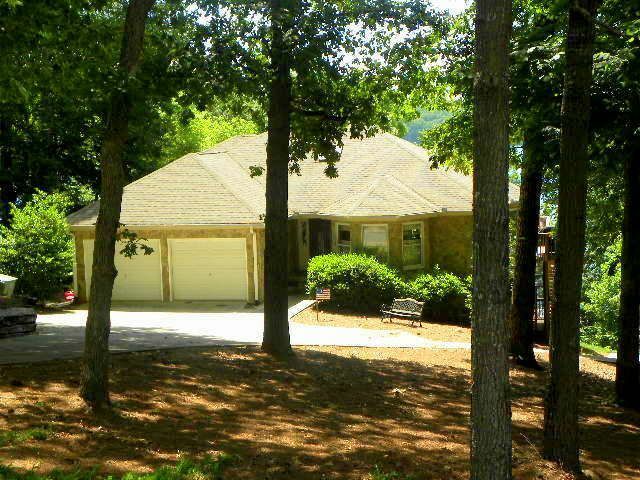 Lake front 3 bedroom/ 2.5 bath home on the beautiful Lake Hartwell on the South Carolina side off Exit 11. An open family and dining space with sprawling decks overlooking the lake, 2 stone fireplaces, oversized master suite and so much more! Our family bought our lake house in 2002. We just love to spend time here. Leave your watch at home and come enjoy lake time! Lake Hartwell is a large lake - away from the big city. Very little traffic, and plenty of space for every type of boating activity. We love to be on the boat deck in the late afternoon. The sun sets beyond our house - with a beautiful reflection accross the lake. We also love to play games and talk at the second sitting area in the living room. My family stayed in this home for our daughter's graduation from Clemson. It was the perfect setting to a wonderful family event. The house is well appointed, clean, and a FUN place to stay with a pool table, hot tub and deck for gorgeous views. The pictures don't do the house justice...the furnishings were outstanding. The beds were incredibly comfy and the bed pillows were the best! We enjoyed the January rain and spent most of our time in the "conversation pit" made up of 4 Pottery Barn chairs overlooking the lake. Great catch up time with family. We spent a wonderful getaway weekend in January at this comfortable house. Who knew it would be a 70 degree weekend?! The house was so well appointed and had everything that we needed. We got to enjoy the beautiful view outside all weekend with so much privacy. It was quiet and so relaxing. We will definately return for another terrific experience! Beautiful property; true to listing description and photos. Most comfortable bedding we've ever experienced. Will definitely go back next December, if not before! View of Lake Hartwell is breathtaking, enjoyed morning beverages and evening cocktails on the deck. A great time was had by all! Thank you for the use of your beautiful home again. Same as last year everything was great. It was a great place to come for relaxation and rest. The weather was also great. The lake view was wonderful for the fall of the year. We had a great time. Hope to visit it next year. Just got home after a four day stay at this home on Lake Hartwell. The pictures make the home look nice but it is even nicer than the pictures can show. Also, although Lake Hartwell is down, there was plenty of water at this home's dock for me to tie up my boat and for our kids to swim off the dock. My son is 6' 2" and going off the dock feet first and trying to go down as far as he could, he did not hit the bottom so I am guessing it was 15 feet deep or deeper off the end of the dock. We were also able to inflate and put our 12 foot diameter water trampoline about 30 feet of the dock. Portman's Marina is only about five minutes away (driving or by water). I was able to launch my boat there with no problem and refuel there. The home is easy to find by water as it is right at one of the numbered lake bouy's. The home is about half way between Anderson and Clemson. It was an easy boat ride up to Clemson with my son wakeboarding most of the way. We were going to boat down toward Anderson to a waterfront burger/sports bar type resteraunt our last day there but the sky looked threatening so we stayed close to the house that day tubing and wakeboarding. The lake area directly out from the house was relatively quiet and perfect for these activities. The home is well furnished and nicely decorated. We enjoyed the hot tub in the evening's and playing pool on the pool table. We were also able to watch the Olympics in the evenings as the home has satelite TV with three nice TV sets in the home. We had no probelms and I would recommend this home to anyone. 4 night minimum in summer,2 in winter. $150 cleaning fee, 8% tax additional.